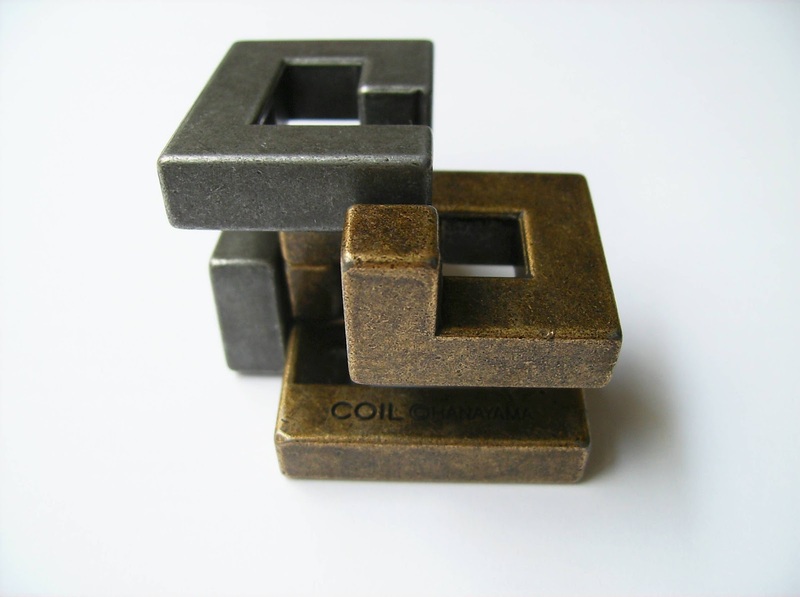 This week's featured Hanayama puzzle is the Cast Coil, designed by Edi Nagata and released early last year. The coil is actually an updated version of the 29th IPP entrant Twin Snake, which was built from Movingui wood and had a couple of different challenges, besides simply taking it apart. The key word for this one is "loops". 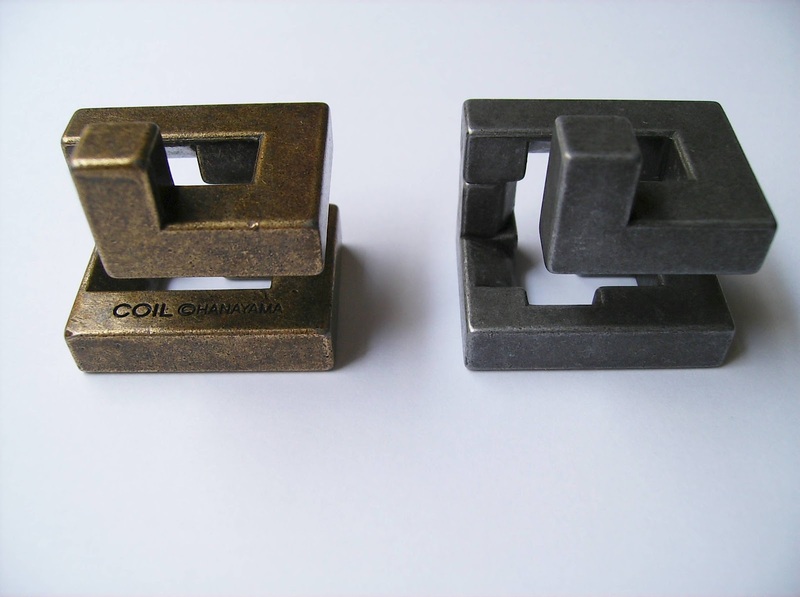 The Coil is comprised of two seemingly identical pieces coiled up and entangled, which at first glance look like four linked pieces. The concept reminds me of Richard Gain's Superstrings, but in a more compact structure. The idea is to take the two pieces apart and then, of course, find a way to coil them up again. The two pieces have each their own color, which gives this stunning alternating pattern of silver and gold. It looks like it's made of brass, at least judging by the smell it leaves on your hands and the smoothness of the surface. I was surprised by how small this one is, compared to other Cast puzzles: it measures only 3.3cm in height and 2.5cm in length (that's about 1.3" x 1"). Difficulty-wise, the Coil is not that hard. Hanayama rates it as a level 3 out of 6, and unless you're really unlucky, you should be able to solve it within 10 minutes or so. The solution is not exactly as straightforward as you'd expect it, but once you get the hang of it on how the pieces maneuver, it becomes clearer. Some of the moves you'll be doing involve sliding and rotating, and even though it moves counter-intuitively due to its angular shape, there are a few strategically placed circular cuts that will help you rotate the pieces in the desired way. 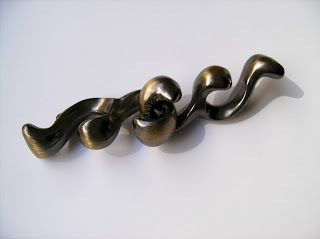 Availability: You can get a copy of the Cast Coil at Sloyd.fi, as well as all the others in the Cast Puzzle Series. The Cone, from the German manufacturer Philos, is a very nice wooden puzzle, designed by Andrew Snowie, which will show you that appearances can be deceiving. 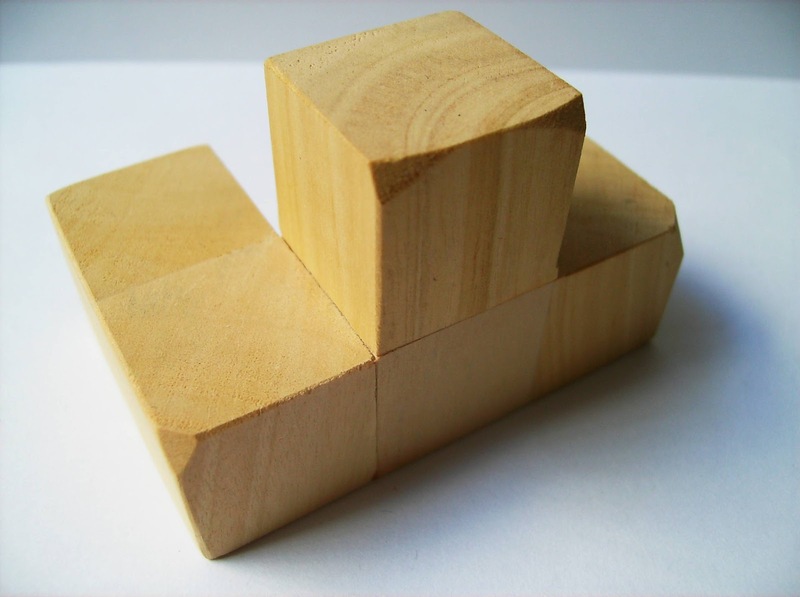 At first, it doesn't look like it's difficult at all, because the pieces all have distinct shapes, but as you start to disassemble it you'll soon discover that it may be harder than you were expecting it to be. The concept behind the Cone is quite original, but I guess they ran out of originality when it came to name the puzzle as simply Cone. They could have used some puns with the word cone, like Cone-demned - Probably a bit lame, but it's just a thought... As I was saying, the concept of the puzzle is fantastic, and that's what really matters. The puzzle has a striking visual appearance, with some of the pieces in a contrasting color, although they're random colored and won't help you in the actual solution. They do make for a nice visual effect, though. I also like how the pieces are cut, as though they'd represent different cross sections in a cone. The 13 pieces comprising the puzzle are a mixture of rounded shapes and three "special" ones (two tetrominoes and one pentomino). 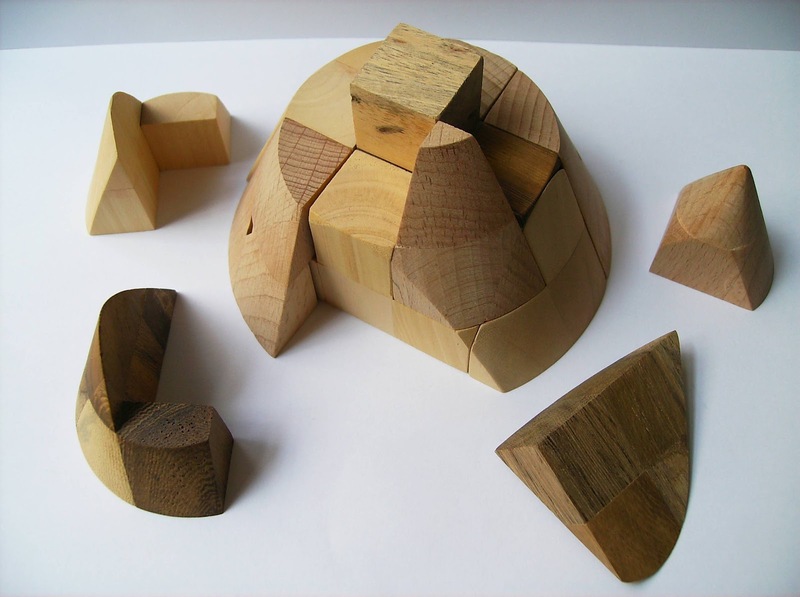 These special pieces are hidden underneath the round-shaped ones and once the puzzle is taken apart, they're the harder ones to assemble back. In order to make the special pieces fit inside the puzzle without having their corners showing on the outside, some of the corners were truncated to make the outside surface as smooth as possible. The Cone puzzle is definitely a nice puzzle to play with. Philos makes some really nice puzzles and this one is no exception. 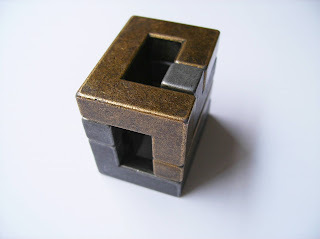 Puzzler or not, I believe you'll enjoy this one, not only as a nice decorative object, but also as a fun challenge. Worth a try. 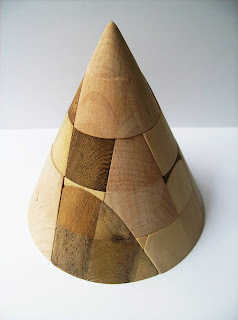 Availability: The Cone puzzle is available at PuzzleMaster for about $31 CAD. Today, I bring you a classic puzzle produced by ThinkFun, the Spin-Out, which was invented by William Keister in 1970 (patented in 1972). 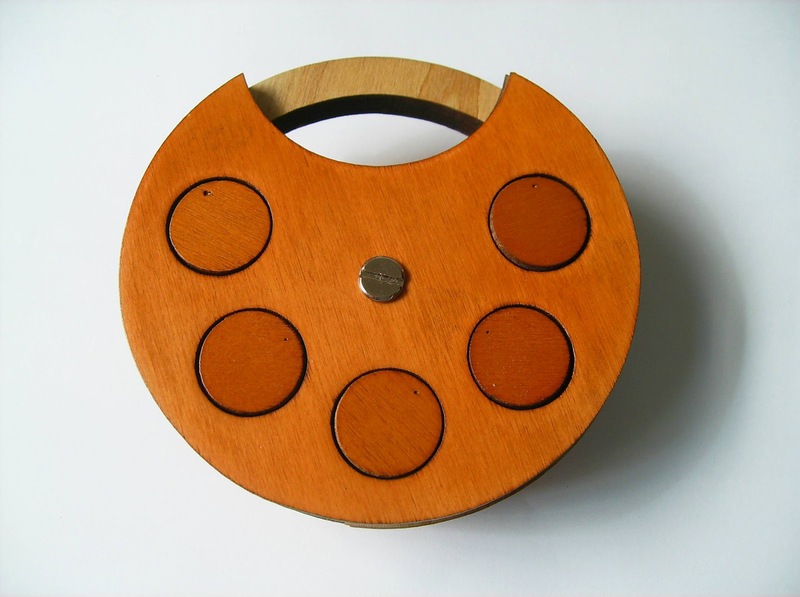 Considered to be a modern version of the Chinese Rings, which are believed to date back over 2000 years ago, the Spin-Out was first introduced to the public in 1987, when the company was still known as Binary Arts, later changing its name to ThinkFun in 2003. The Spin-Out (or SpinOut) is a sequential movement puzzle comprised by seven knobs attached to a sliding platform. 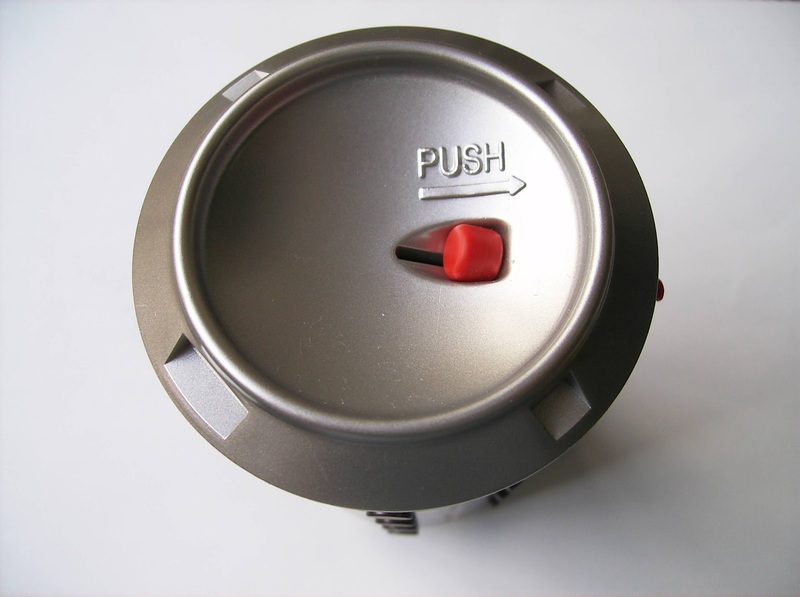 The knobs can be maneuvered into one of two possible states, either horizontal or vertical. 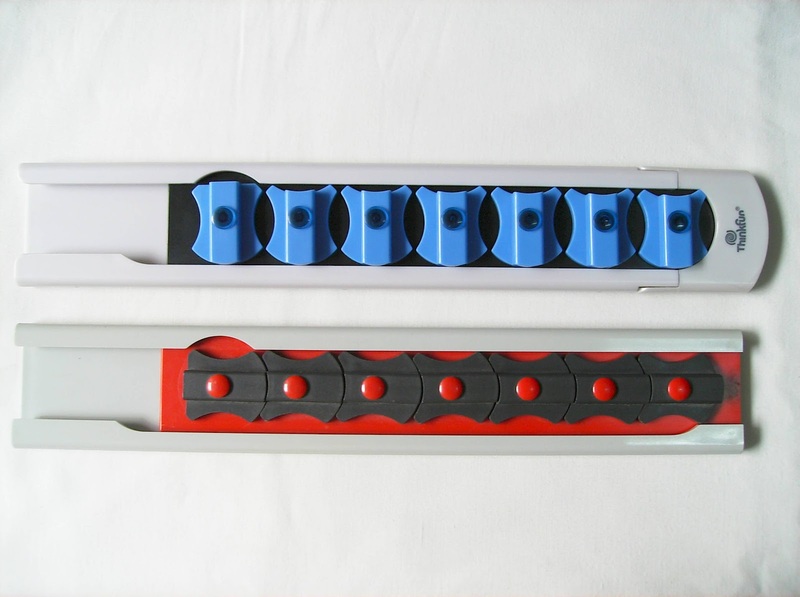 The initial configuration of the puzzle has all knobs in the vertical position, and the goal is simply put them all in the horizontal position, forming a straight line, so the platform can slide out. This sounds simple, but it has more to it than just spinning knobs up and down. Throughout the years there have been a few other versions of the Spin-Out, including one with elephants (see interactive version here). 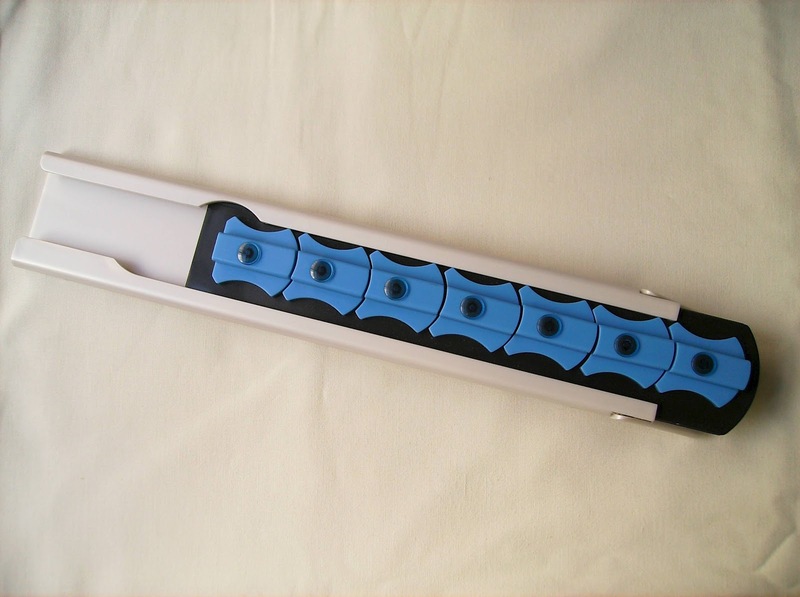 The first version released by Binary Arts had red knobs and the cover was a little simpler. 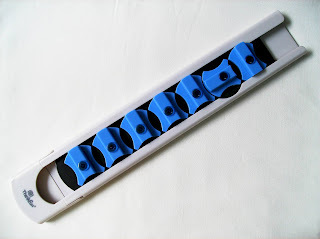 The newer version, revamped by the rebranded ThinkFun in 2005 has a more modern look, with blue knobs and you can see their logo at the bottom. Which one do you think looks better? - I prefer the blue one. The solution of the puzzle is very linear, as it follows a simple binary logic called Gray code. The mechanism is built so that only one knob at a time can be moved. For any knob you want to move, the one immediately to its right has to be in the vertical position and any subsequent ones have to be in the horizontal position. The solution has a minimum of 85 moves and while it uses a simple method, it requires the utmost concentration or you will lose track of your train of thought. This really happened to me a few times - I had to gather my thoughts and analyse where I was in the sequence and what the next move should be. When you understand the logic behind the puzzle, it's not that difficult. What's difficult, as I pointed above, is to keep concentrated and not lose the sequence. When you're able to solve it back and forth (all knobs horizontal and all knobs vertical) you can try to beat your own times and see how fast you can do it. See this video of a kid solving it under 30s. After mastering this puzzle you can try other similar ones that also use the Gray code to be solved. The Brain is another great puzzle that I recommend. Markus Götz designed a much harder version of the Spin-Out called Crazy Elephant Dance, which uses a ternary system. Instead of two states, the elephants can be maneuvered into three possible positions. There's a nice Java applet in the page that lets you play the puzzle with different levels of difficulty. Can you solve it in the harder level? Back when ThinkFun was Binary Arts, their puzzles were much more interesting. The Spin-Out, a simple and yet brilliant concept is proof that a puzzle doesn't need fancy looks to be fun and enjoyable. It's a great puzzle to keep your brain healthy and sharp, while providing a very satisfying and rewarding experience. Availability: Sloyd.fi, in Finland, currently stocks the new blue version of the Spin-Out for just €12. Shipping worldwide is available. Jean Claude Constantin always surprises me with all these extremely creative ideas for his many puzzle designs, and the Smiley Lock Puzzle is no exception. The unconventional concept is nothing short of extraordinary, and if you have experience in opening other types of locks, don't think for a moment that this one's going to be a walk in the park. The Smiley Lock Puzzle is comprised by five knobs that, when turned in the right direction, will open the clever mechanism that keeps it locked. Besides being able to spin these knobs in any direction, you can also move them up and down, which ultimately makes it a bit difficult to figure out what's their correct positioning. My only gripe with the puzzle is its name, aside from its quality, but that's because it wasn't built by Constantin (more of that below). Honestly, I don't see a smiley face, but maybe that's just me. I do see a grumpy face, though, so maybe there was something lost in translation, as the designer is German. Regarding its quality, as hinted above, it's just not good. If you ever got something from Bits and Pieces, you know what I'm talking about. This time, I didn't even noticed it was manufactured by them until I started to research for the review. At the time, I only paid attention to the name of the designer, which is more than enough to convince me. 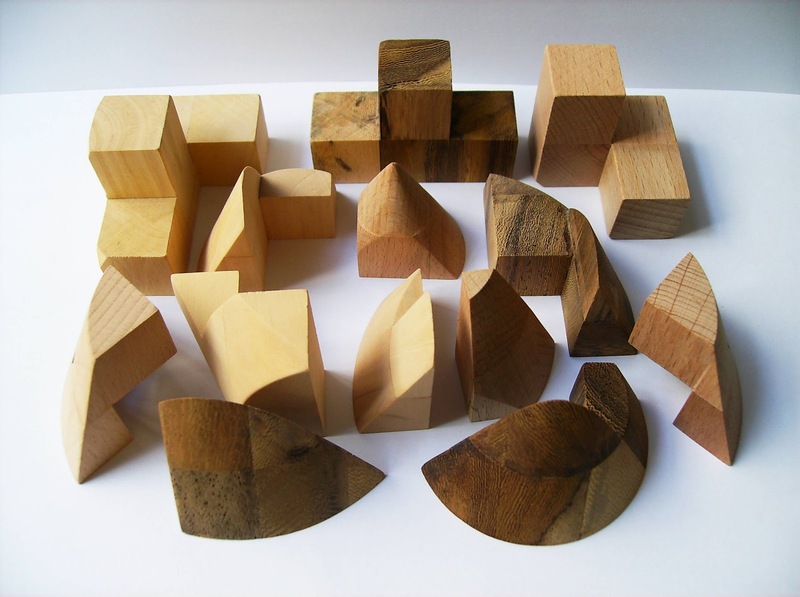 The chosen material is of poor quality, which is some kind of plywood, and knowing this type of puzzles require a different approach, a stronger type of wood or metal would have made a world of difference. They do warn you to be careful and not to use force in the solution sheet, but I don't like to see the solution sheet before I've solved the puzzle, so breaking it is almost inevitable. PuzzleMaster rates the Smiley Lock as a level 8/10, which is about right given the level of complexity of the locking mechanism. The solving times will vary depending on your level of frustration. If you keep it cool, you can do it within 30 minutes or so, otherwise you'll spend several hours torturing yourself. Solution: To see a photo of the Smiley Lock opened, click here. The Smiley Lock is another example of a great puzzle that could have been much better, had it been manufactured by a company that actually cares about puzzles. The concept is brilliant and very well designed, and despite the quality, you can still have fun with it and feel quite challenged. Availability: The Smiley Lock Puzzle is available at PuzzleMaster for about $20 CAD. Today's Cast Puzzle comes from the genius mind of Oskar van Deventer. As a puzzle designer, Oskar has an enthusiasm for mazes and labyrinths, and this shows in many of his creations. The Cast Disk, while it's not exactly a maze, it still feels like one in the sense that you may find yourself going in circles without the slightest hint of where the exit may be. 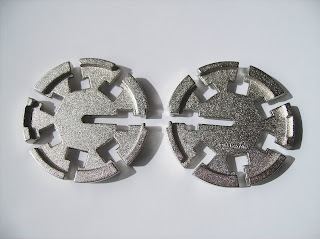 The Disk was released by Hanayama in May 2001 and the key word for it is "circle". If you have previously played with the Cast O'Gear, then you'll find a slight resemblance with between the two concepts, as both of them have you going around in a circle in order to remove one of the pieces. In my opinion, I liked the design of the O'Gear better, but I enjoyed the challenge of the Disk much better. 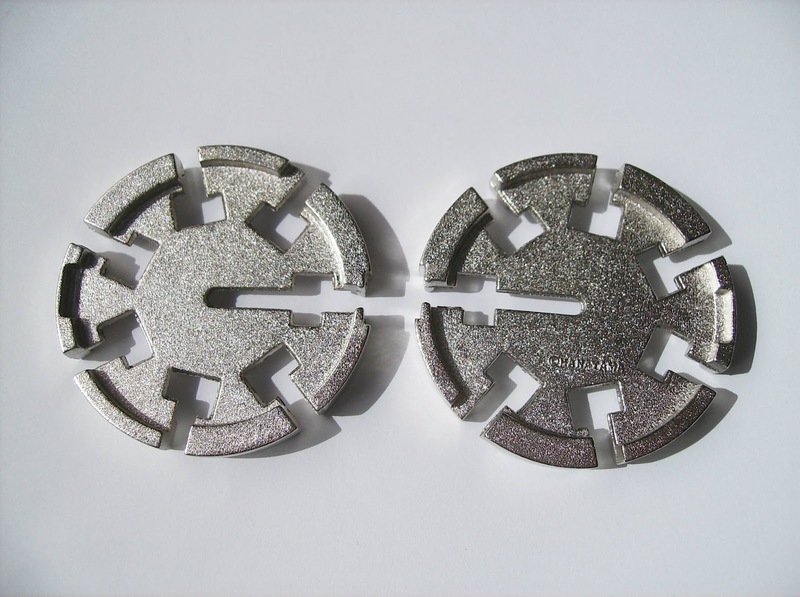 The design of the Disk is reminiscent of two cogs that are interlinked and the object is to try and separate them. This would be an effortless task if the disks had all their dents with equal measurements... They actually don't, and this makes the puzzle very fun to play with. Both disks appear to be fused together at a perpendicular plane in their starting position, and this very state is the one you're going for once you separate them and try to put them back together. The dents appear to be identical in both disks, but they are, in reality, a mirror image of each other. Hanayama rates the Disk as a level 2/6, and I sort of agree... While it may be a little confusing to keep rotating the disks back and forth and not see a real progress, a careful observation and some persistence will have you separate the disks within 5 or 10 minutes. If you do it randomly, you might be at it for a while. When you first start to rotate the disks you'll notice that in order to pass to the next opening, you won't be able to perform more than two or three rotations at a time around the same dent. You need to analyse each of these dents and realize which one is the most likely to free the other disk, otherwise you'll keep returning to exact same spot over and over again. The movements necessary to free the disks won't always be in the same direction, as both clockwise and anti-clockwise movements are needed. Returning them to their original state is a bit easier, because you can clearly see where they're supposed to be joined together, unlike the opposite challenge, where the exit is not that easy to see. The challenge of Cast Disk won't probably offer too much resistance and it's far from being frustrating, but one thing that I love about most Cast Puzzles is that even when they're easy to solve they're still quite fun and enjoyable. The path to solve the Disk is not that easy to remember, so after you've solved it you can still pick it up again for another run. Availability: You can get a copy of the Cast Disk at Sloyd.fi, as well as any of the others in the Cast Series. George Bell's analysis of the Cast Disk and Cast Duet. The Grabarchuk Family are masters at creating slide puzzles. 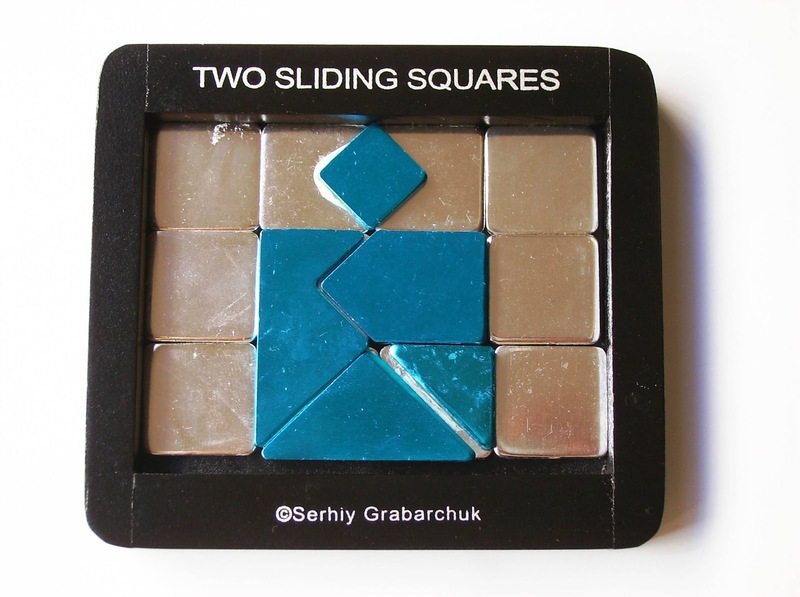 The Two Sliding Squares is a design by Serhiy Grabarchuk, and what a puzzle this is - One of the hardest sliding puzzles I've seen in a while. The concept of the Two Sliding Squares is a bit difficult to understand at first, but it's actually pretty straightforward. The puzzle has two layers: one is made out of silver squares only and the other is comprised of blue fragments that are attached to some of the silver squares. The fragments, when placed at the right positions, will form two valid states: the first is relative to the start position and will show two blue squares, a small one and a bigger one. The other state is the end position, or if you will, the object of the puzzle, which is merging those two squares into a larger unique square. This task has to be done solely by sliding the pieces inside the tray and no piece shall be lifted from the playing field. So why would I get a puzzle from Bits and Pieces knowing beforehand that I shouldn't expect anything good from them? - Simple answer: because it's a Grabarchuk puzzle and I like to support talented designers. If you care more about the concept and are willing to overlook the manufacturing flaws, you're left with a fantastic puzzle. The idea is very original and nothing like I've ever seen in a slide puzzle. Your task is to go from one position to another, but between the two there's actually about 50 different moves. The provided solution shows just 45 moves, but I reckon it must have taken me over 100. This is rated by PuzzleMaster as a level 8/10, although from my experience it feels more like a 9, as the sliding moves aren't as simple as you're used to in a classic slide tile puzzle. In this 4x3 grid puzzle, you start by removing any of the plain silver squares to make room for the others to slide back and forth. However, as you make your very first movements, you'll encounter the first setbacks: some of the pieces will only go to a certain position until they no longer can be moved any further. This is due to the configuration of the pieces, because the blue parts are glued to the silver squares and most of the times they overlap to the neighboring space, not leaving enough room for another piece to move past it. Planning ahead, as you can imagine, is crucial to keep the pieces moving albeit sometimes quite irritating and frustrating, but extremely satisfying. If you like to collect puzzles for their beautiful presentation and overall appearance, this may not be the right one for you. Bits and Pieces have managed, again, to ruin what could have been great to a mediocre puzzle, to say the least. 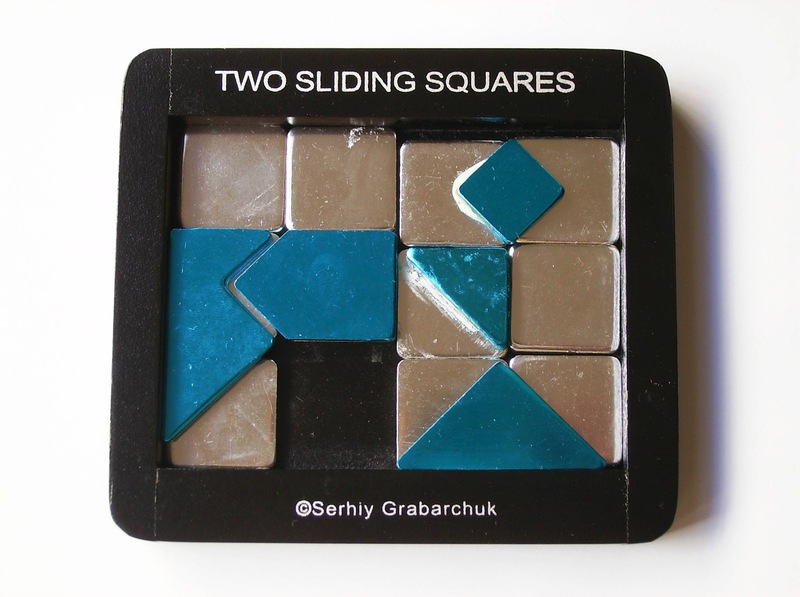 The concept by Serhiy Grabarchuk is beyond amazing, though, and if you like slide puzzle, give this one a try. It's worth it even if the presentation leaves much to be desired. 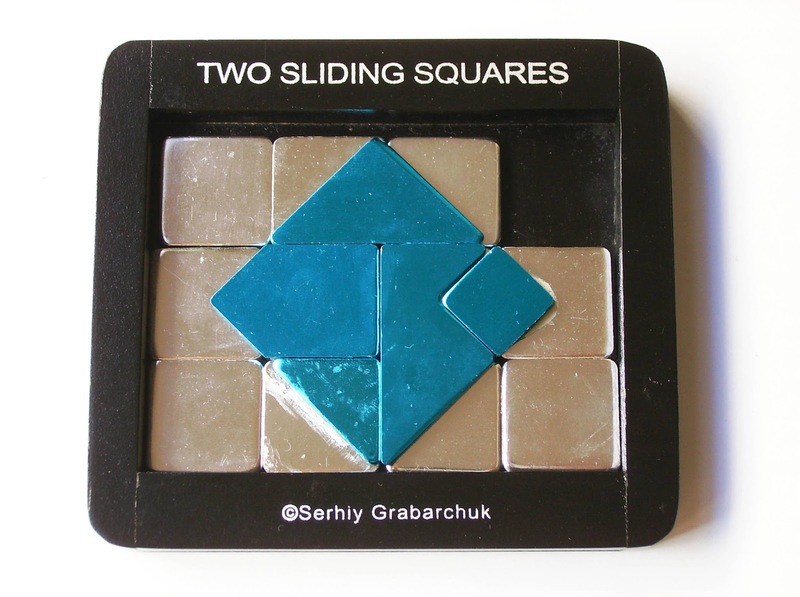 Availability: I got my copy of Two Sliding Squares from PuzzleMaster, but they are sold out at the moment. Check back again soon, as they restock regularly. 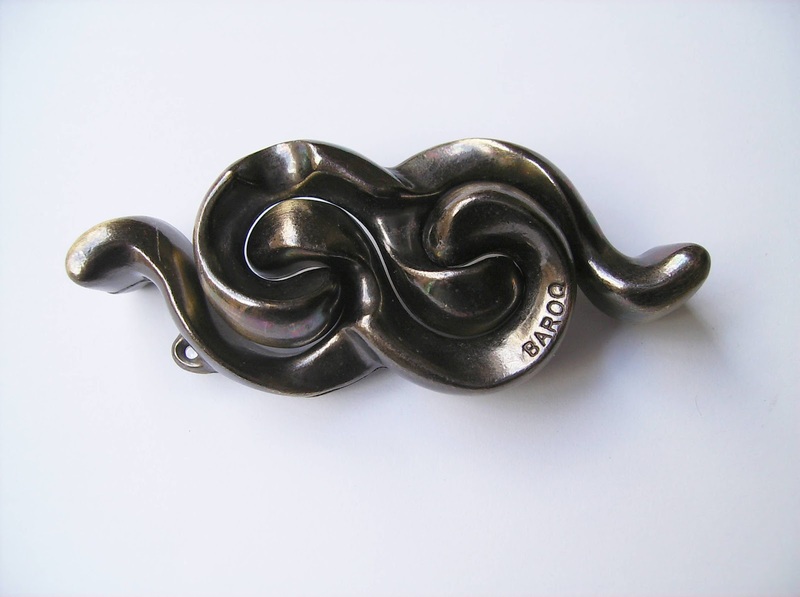 Akio Yamamoto, one of the few designers who contributed the most of his creations for the Cast Series, is the brains behind another fantastic Cast Puzzle, the Baroq. 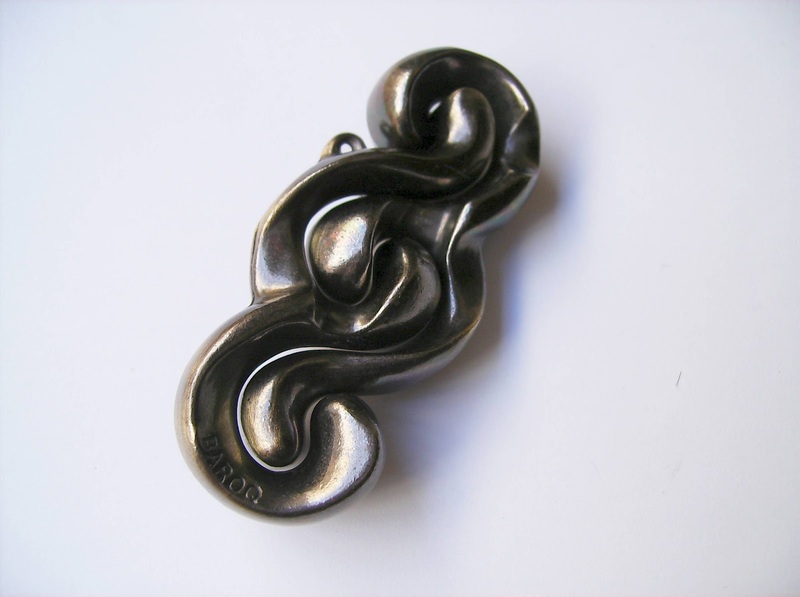 It was released by Hanayama in November 2003 and the key word for it is "music". The design of the puzzle was inspired by the image of intertwining Bach melodies (read more about musical riddles here), and as you can see, the result is a pleasantly beautiful object that looks much more like a piece of art than a puzzle. Yamamoto has this great quality of adding a touch of art to his designs, and we can testify this by looking at another one of his brilliant creations, the Radix. Everything in this puzzle screams elegance. Even the solution was extremely well thought out, reminiscent of two dancers performing a perfectly timed and synchronous choreography. 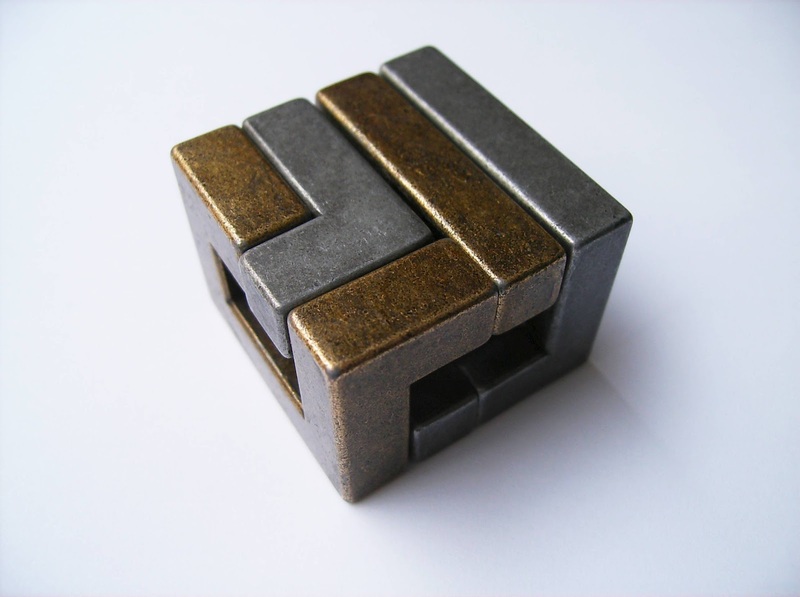 The material chosen for this particular puzzle is also a perfect fit, which is a very well polished brass with highlights of black and gold. The object of the puzzle is pretty straightforward, but not the solution, though. The two pieces are intertwined at the ends and need to be separated. How it's done is a whole different story and requires a clever approach and understanding of the curvy design. Both parts seem identical, but a more careful observation denotes subtle differences. Hanayama has a level rating between 1 and 6, and the Baroq falls right into the second half as a level 4 - Not particularly nerve-wracking, but will have you scratching your head at some moments. Update: I have received feedback from two fellow collectors about the tightness of the puzzle: One of them reports that his copy is too tight and the other says that his' "smooth as butter". It appears that the cut tolerances in the metal are not exact from puzzle to puzzle, so it'll be a matter of luck when you get yours. If you do get one that it's too tight, just ask for a replacement from the place you bought it. (Thanks Jared and Coaster1235 for the feedback). 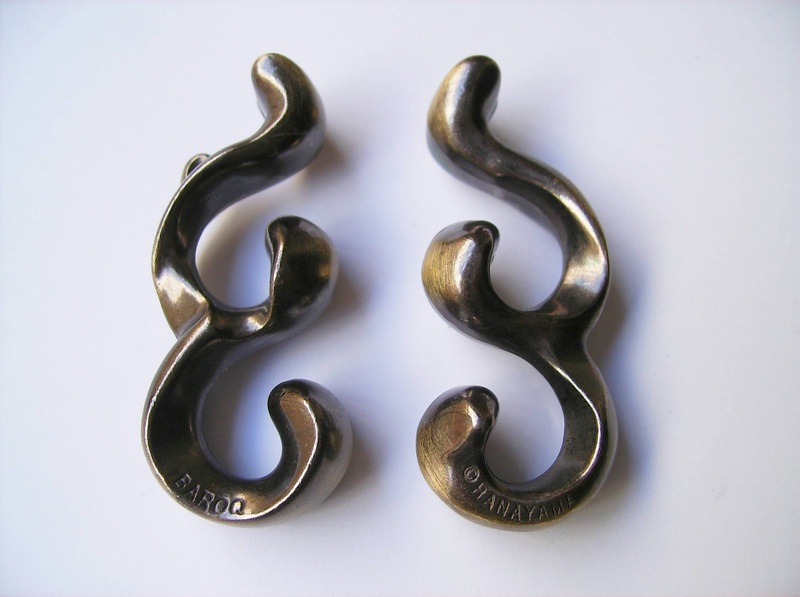 The Cast Baroq is yet another reason why I consider Hanayama one of the best puzzle manufacturers in the world. 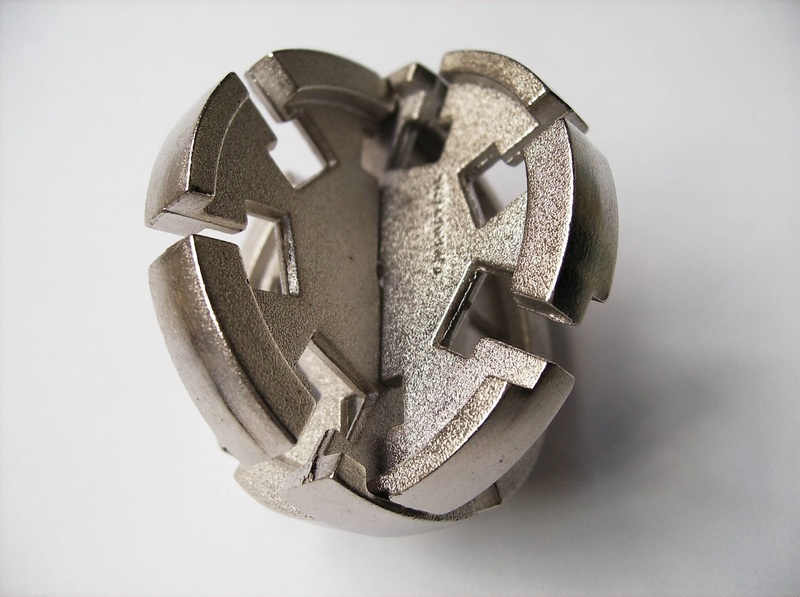 It's a visually stunning object and one of the most elegant solutions I've seen in a puzzle. With over 50 puzzles released in the Cast Series, it's difficult to choose one if you're undecided, but if you happen to choose the Cast Baroq I guarantee you, you won't regret it. Simply amazing! Availability: Sloyd.fi is the perfect place to get your Cast Puzzles. You can find there the Cast Baroq, among all the others in the series. 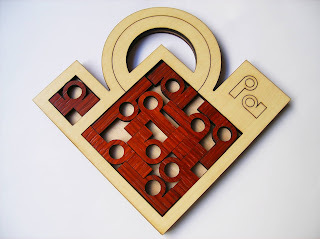 P and A is yet another brilliant design by German craftsman Jean Claude Constantin - I'm yet to find one of his puzzles that I don't like. P and A is a simple name for a puzzle, but I guarantee you that solving it is anything but simple. One thing that immediately captures your attention is the shape of the pieces, which are based on the letters p and a, and it's nothing like I've ever seen before in a puzzle. This is one of the reasons I like Constantin's puzzles so much. He has this genius ability to come up with these extremely original concepts and ideas, and even if you've seen all kinds of puzzles over the years, you'll still be amazed by his creativity. Constantin not only creates great puzzles, but he also excels in their presentation, which is on par with his puzzle concepts. In the P and A puzzle, the difference between an average-looking puzzle and a stunning visual appearance is that he took extra care in the design of the tray, which is based on one of the pieces. The contrast between the dark color of the pieces and the pale color of the tray is a perfect fit to the already outstanding design. The puzzle contains nine pieces already packed inside the tray and an extra one in a small compartment. The object, like any other packing puzzle, is to rearrange the pieces in order to make room for the final tenth piece. The irregular shapes of the pieces will make your task a little tough, but there's a couple of strategies you can use to make the challenge a little less complex. This one's rated by PuzzleMaster as a level 8/10, so while not being extremely tough, you'll still encounter some difficulties until you'll be able to place that final piece. One thing that also adds for complexity level is the double-sided pieces, as their surface is identical on both sides. With this in mind, there are still some things that can help you towards a solution, though: One of them would be to separate the pieces and work out which ones you can use on the edges of the tray and the ones you can't; If you take a close look at how the pieces are packed in the nine-piece solution, you'll notice that there are plenty of empty spaces. This will change in the harder solution, because almost no empty spaces are left when all the pieces are packed. I can give you a hint as well: In the final solution, and excluding the natural spaces left by the curved shapes, only one single unit space is left empty. Other than that, all of the tray area will be occupied by the pieces. Solution: Click here to download a solution if you have given up or you can check out my photo of the solution here. I'm not sure if there's only one solution or more, but after comparing my solution with the downloaded one, the only difference I see is that they're a mirrored image from each other, so that's still counts as the same solution. Let me know if you find a different one. What's more to say? 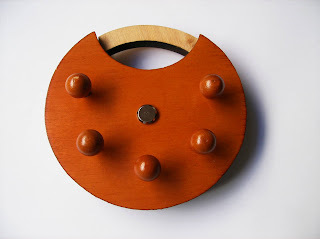 - Another brilliant puzzle by Jean Claude Constantin. The man just can't make a bad puzzle. From the actual design of the pieces to the final flawless presentation, everything in the P and A is tied in into a striking-looking puzzle and a great challenge. Definitely worth a try and a must-have for any collector. Availability: PuzzleMaster is the place to find the P and A puzzle and all things Constantin. As a mechanical puzzle collector and enthusiast, I have a very eclectic taste when it comes to choosing new puzzles. However, there's one type of puzzles I particularly don't care about, and that's Jigsaw puzzles. Mainly because I find them boring and not very challenging. So why am I reviewing a Jigsaw puzzle, then? - Well, this one's a bit different and a rather original take on the 3D Jigsaw. It's not the first time I see soda cans being used as puzzles. In fact, some of you might remember the slide tile cans from the early 90's (see two examples here and here). It's the first time, though, that I see them being used as Jigsaw puzzles and I really liked the idea, so I decided to give the Sprite Can a go. 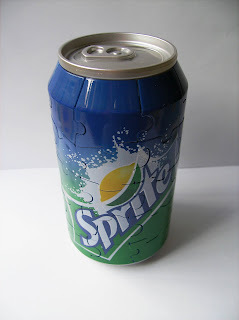 The Sprite Can, as you can see from the above photo, is a close representation, to scale, of a real Sprite can (the puzzle can is actually slightly bigger than the original, but that may be due to differences in European and American size standards). The graphical representation is also much simpler in the puzzle replica, where only the logos are visible (no small print info). Other than that, it's close enough and the idea is brilliant. 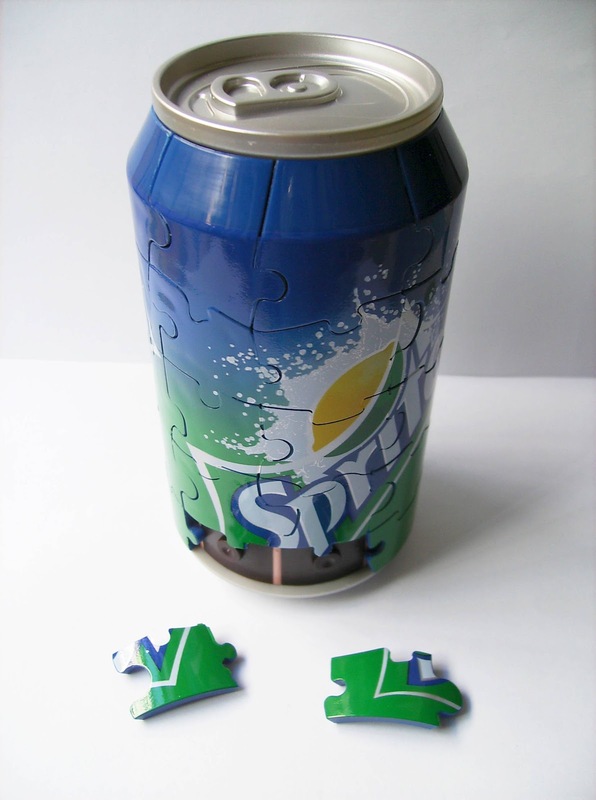 The puzzle itself is comprised by 40 pieces which are slightly curved to fit the can's contours. 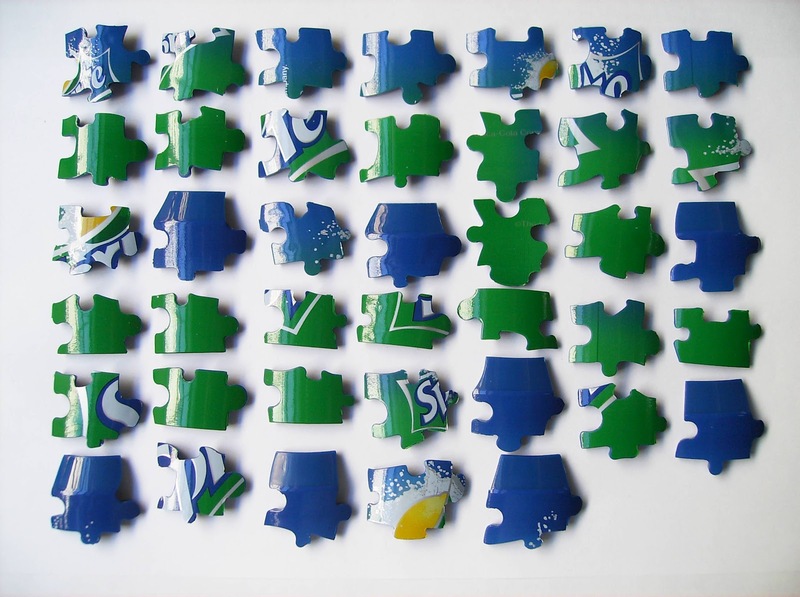 The concept is similar to Ravensburger's Puzzleballs in the sense that the pieces are not shaped like the traditional Jigsaw puzzles. 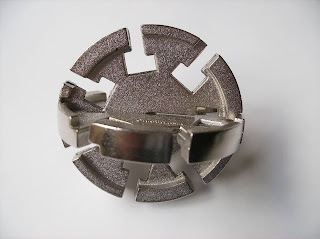 The pieces stay in place by a click mechanism: There are pins on the can where each piece goes, which in turn click into place with the grooves on the back of the piece. One of the main differences with traditional Jigsaws, besides the shape, is that the puzzle comes already in its solved state right out of the box. Might not be ideal, because you're seeing the final stage, but it's not that big of a deal, as the puzzle aspect of it is not the main reason you'll be getting one, is it? - For me, it's because it has that "Wow" factor, which not every puzzle is able to accomplish. To help you remove the pieces more easily, there's a pin on the bottom of the can (above photo) that you can push which will pop the first piece and make room to remove the others. As you proceed with the removal of the pieces, you'll notice that very small paint chips will start to come off. 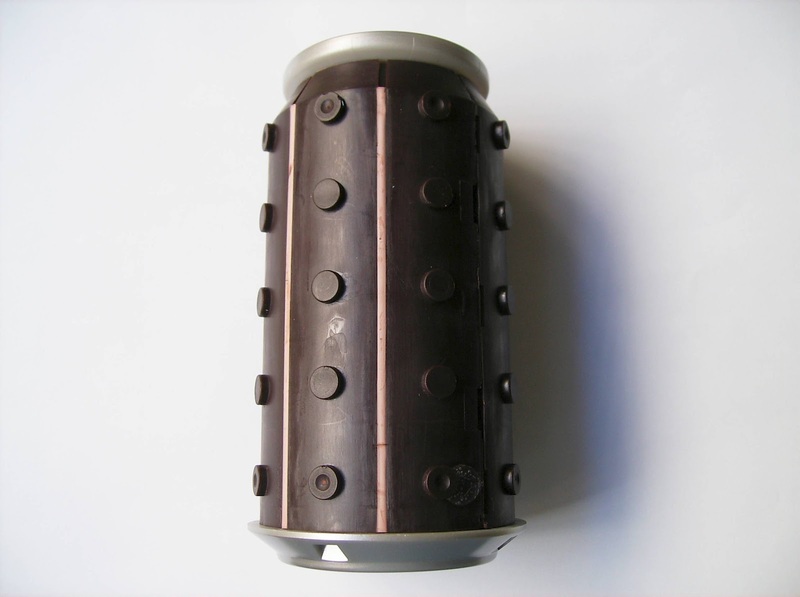 This is due to the layer of coating being applied to the can with the pieces in place. The result is that when it dries, the edges of the pieces will be sort of fused together by this thin layer of paint. So, besides working towards solving the puzzle, you'll also be occupied trying to clean each piece from the excessive paint. While it may look like a minor setback, the puzzle will still be quite fun to put together. Not challenging in any way, but very enjoyable nonetheless. The Sprite Can was a very welcoming addition to my collection. What lacks in difficulty definitely makes up for a striking visual appearance. It'll most certainly look great on any collection and deserves a special place on your puzzle shelf. 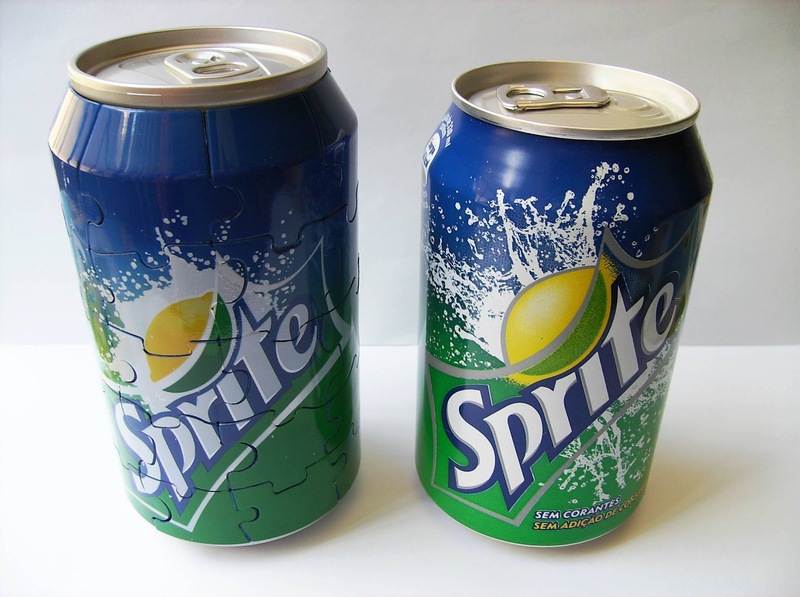 Availability: The Sprite Can - 3D Jigsaw came from BrilliantPuzzles.com, and they also have the Diet Coke and Coca Cola versions as well, if you prefer.